Ethernet cables may look the same as they did five or ten years ago. But don’t be fooled by the outside. Big changes have come down the line for category cables. No longer do you need just a cat5 installer; cat5e has become the new standard with cat6 poised to make the jump to the number one spot down the line. The essential differences between cat5 and cat6 have to do with their ability to handle different internet speeds over longer distances and their internal construction. Now that technology moves so fast – even for cabling which tends to move slower than your typical iPhone lifespan – when you look into cabling for your office, you’re looking into the future. 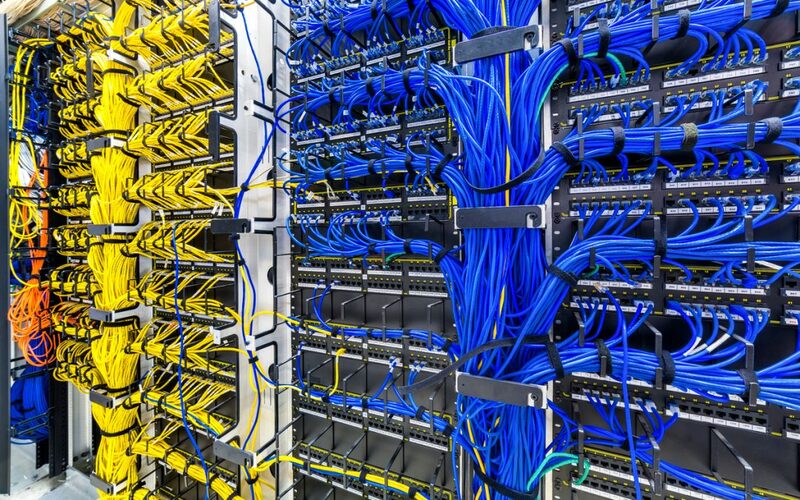 How do you plan to have the most cutting-edge cabling network for the longest time frame? By preparing for what comes next. But how far ahead do you need to future proof your particular office? Do you need the most cutting edge cables? Let’s take a look at what to keep in mind when future proofing your network with a cat6 installer. Originally when it came to ethernet cables, your options were Cat5, Cat5e, or Cat6. But now the real contenders as far as future-proofing your network are Cat6 and Cat6A. Cat6 supports 10 Gigabit ethernet, but only over a distance of 164 feet. The tighter twist throughout the Cat6 wires also allows for two-way communication, a capability that neither Cat5 nor Cat5e have. Cat6 is faster overall and can also offer two-way communication. Cat6A is the newest cable on the market and offers several advantages to Cat6. Cat6A cables double the supported distance of 10 gigabit ethernet at 328 feet and 500MHz. As the most cutting edge, Cat6A features reduced crosstalk with tighter twists. The cable is backwards compatible with Cat5 and Cat5e, but this will significantly reduce the network speed down to the capabilities of Cat5 and Cat5e. While Cat6A does require additional testing, network testers are now preconfigured to make testing quick and easy. Different cables fulfill the needs of different buildings. For example, Cat5 cabling is not commonly used anymore while Cat5e cables are used mostly for residential applications. Cat6 is used in brand new buildings, while any Cat6 installer can tell you that Cat6A is used mostly for commercial networking. When you discuss what type of cabling would be best with your installer, consider not only what your needs are now, but what they’ll be in the future. Perhaps your new building has Cat6 at the moment which is fine for your small office space, but you’re hoping to expand your network to broader commercial applications within the next five years. If this is the case, then your Cat6 installer will probably suggest Cat6A cabling. Is the latest technology worth the cost? Budget is a large consideration when setting up your IT network. There’s no doubt about it—Cat6a cables are more expensive. However, you also have to consider how much slower internet would impact your business. Could it lead to more downtime? Will it have a real effect on the efficiency of all of your communication systems? A good Cat6 Installer will be able to help you answer these questions. Make sure you consider your other systems. If you have a VoIP phone system, Cat6A cables may be worth the extra cost because of the better call quality you’ll receive. However, if you have your typical landline, your phone system won’t receive any benefit from better cabling. Does the cost of an early replacement outweigh the install cost of Cat6A? It’s true. Cat6A is more expensive than Cat6. However, keep in mind that Cat6A will stick around for longer and be more compatible with the tech of the future. Not only should you consider the cost of decreased productivity or added downtime, but also consider what the cost would be if you have to replace your cabling within five years and undergo the whole process again. Remember to include any downtime or limited services into your calculations. If you choose to go with Cat5e or Cat6, chances are your cabling system will need to be replaced sooner than if you go Cat6A. What happens when all phone systems are upgraded to VoIP in the next few years and your old cables can’t support the newer technology? Remember that your cables will need to be able to keep up with the speed of progress in your other communication systems as well. Can you find a knowledgeable installer? Take a look back through this article and make a note of every time you see the phrase Cat6 installer. The installer you choose will be guiding you through the entire installation process. If your Cat6 installer isn’t knowledgeable enough to answer your questions, chances are your installation job will be lower quality than a more educated installer. When picking a Cat6 installer, or Cat6a or Cat5 even, consider one that is keeping up with the trends of their industry. Ideally, you won’t have to replace your cables for a good ten years. If you’re calling your installer back for a whole system replacement before then, chances are your cat6 installer wasn’t on-trend enough to truly future proof your cabling. By turning to Medlin, you’re trusting a partner who can help you select and install the right technology solutions, all with a complete view of your system integration. Here at Medlin, we look to the future when installing new technology, not only within that system, but within the other systems that have to be integrated into it. it’s good to know that it only takes one call to get superior guidance from Medlin. So when you’re ready to decide on what type of cabling you need, call Medlin today. We’ll set you up with the right cabling for your business’ needs. Whatever it takes.